The Earth has been leaking radiation for just over a century, when we ushered in the radio age and then when we brought in the era of television. And if any technologically advanced civilizations among the stars had a powerful antenna about the size of our solar system, they might be able to pick up a few of those diffuse signals from bygone eras. But now some private citizens, scientists, and entrepreneurs are sending more focused messages through the cosmos, which could theoretically be intercepted by smaller antennae, essentially advertising the existence and location of Earth. Is it ethical to do that—or could it needlessly put humanity at risk? That’s one of the many questions being debated by philosophers, linguists, and astrobiologists at the Social and Conceptual Issues in Astrobiology (SoCIA) conference in Reno this weekend. Kelly Smith, Sheri Wells-Jensen, and Jacob Haqq-Misra join Ira for a conversation about communicating with the great beyond. Kelly Smith is acting president of the Social and Conceptual Issues in Astrobiology (SoCIA) conference, and an associate professor of Philosophy at Clemson University in Clemson, South Carolina. Jacob Haqq-Misra is a research scientist with the Blue Marble Space Institute of Science in Clayton, Delaware. IRA FLATOW: This is Science Friday. I’m Ira Flatow. Voyager’s golden record contains a multitude of messages to space-faring aliens that find it– recordings of the natural world, photos and diagrams of DNA and human anatomy, classical and rock music, and of course greetings in dozens of the world’s languages. SPEAKER 2: Hello from the children of planet Earth. IRA FLATOW: But those messages contain a lot of assumptions, human assumptions about what might make sense to alien intelligence. What if, for example, they took that collection of different voices as a sign of people in conflict, some sort of argument among a group? Should we perhaps try for a simpler message, or maybe no message at all? Because what if our communications invite danger or hungry aliens? You’ve probably heard of SETI, the Search for Extraterrestrial Intelligence, but there’s also a group called METI, Messaging Extraterrestrial Intelligence. And some of my next guests are advisors to that group, working to determine the future of our communications with the cosmos. Many of them are gathering this week in Reno, Nevada for a Social and Conceptual Issues in Astrobiology, or SoCIA conference. And we have two of them on the line now. Kelly Smith is acting president of SoCIA associated professor of philosophy at Clemson University in South Carolina. Welcome. KELLY SMITH: Thank you. Nice to be here Ira. IRA FLATOW: Nice to have you. Sheri Wells-Jensen is a linguist and associate professor of English at Bowling Green State University in Ohio. Welcome back to Science Friday. SHERI WELLS-JENSEN: Thank you. It’s a delight. IRA FLATOW: So you’re there in Nevada doing all of this interesting talk. Kelly, you helped convene this conference. Set the scene for us. What’s the goal of that gathering? You have astrobiologists and philosophers and all kinds of different people. KELLY SMITH: Yeah, if we discover evidence of life beyond Earth anytime soon– and a lot of people think that’s likely– the implications for humanity will be massive. And so I and some like-minded people feel like this is something we should be dedicating a bit more effort to. And so we’re trying to organize an academic community that provides the infrastructure necessary for that– so regular meetings, eventually we’ll have our own journal, and then just the ability to talk to colleagues in different disciplines who are interested not just in the science but in the broader questions about what the impacts of the scientific discoveries are on society. IRA FLATOW: And one of the big questions is, should we actively engage in sending messages into the cosmos, correct? KELLY SMITH: That’s one of the big, hot topics. I think maybe a quarter of the papers at this conference are going to be on METI in some way or another. IRA FLATOW: Sheri, you’ve said the Voyager golden record was packed with too much information, which leaves it open to misinterpretation. Give us an idea of what you mean by that. SHERI WELLS-JENSEN: Well, it really depends on what your goals are. If your goal is to say, hey, we exist, we’re intelligent, we’re here, we’re like you, maybe– we’re at least thinking– then almost anything you send can accomplish that. But if your goal is to actually contribute a piece of information so that they can actually understand anything about who the heck you are and what you’re all about, then what we generally do is overwhelm when we send a lot of information. So maybe we want to keep it just simple and just for the initial contact say, we exist. Isn’t it cool? We exist too. Yay! SPEAKER 3: Mr. Chambers, don’t get on that ship. To Serve Man, it’s a cookbook. IRA FLATOW: You all know that one, right? IRA FLATOW: Spoiler alert 50 years later. But people should rightfully be fearful of that, that if we do let aliens know we’re here they may want to take over our planet? KELLY SMITH: Well, I think it’s certainly a possibility. I think a lot of the METI proponents point out, rightfully, that people worry about this in weird ways that are influenced by Hollywood, et cetera. But the bottom line is, we don’t really know that much about aliens and we don’t know that much about what might motivate them. And so reaching out to aliens and advertising not just our existence but our location does pose some kind of risk. The tricky bit is trying to figure out how much risk it poses and then what kinds of restrictions would be required given that level of risk. Right now there are none. Anybody can do anything they want to pretty much. IRA FLATOW: –trying to figure out how to speak to the aliens. SHERI WELLS-JENSEN: We do. We have issues. We certainly have issues. I mean, just look around you any day. You’ll see even people who love each other having trouble communicating. But in some ways, sort of that horse has already run out of the barn. We are mounted. We are changing our atmosphere. We have been broadcasting. Like Kelly said, people have been sending all kinds of random stuff, and some not-so-random stuff. So anyone who wants to know we’re here could, and maybe already does. IRA FLATOW: And if you’d like to talk about it with us, our number is 844-724-8255. You can also tweet us @SciFri, 844-744-8255. I’d like to bring on another guest who wasn’t able to make the conference this weekend but he has done some thinking about this. Jacob Haqq-Misra is a research scientist at the Blue Marble Space Institute of Science based in Clayton, Delaware. Welcome to Science Friday. JACOB HAQQ-MISRA: Thanks a lot for having me. IRA FLATOW: You study exoplanets and which ones might be good targets to send a message to. Are there a few hot spots that we should be pointing at in the universe? JACOB HAQQ-MISRA: Well, there are a few hot spots. But you know, I’m really glad that the segment started with a discussion about TESS, because I’m really excited about TESS. And I think TESS is going to find the best hot spots. Right now we know about some planets, just TRAPPIST-1, a seven-planet system around a low-mass red dwarf star, very exciting. Possibly one of them in the habitable zone, a couple that might be interesting. Proxima b, the nearest star to our sun, has a planet. These are exciting. But I think TESS is going to find literally thousands of planets that are really close to our sun. I think these are going to be the best targets for METI, also for SETI though. I think that’s an important point. These are also going to be important targets to search as well as thinking about messaging. IRA FLATOW: Could intelligent life have been sending us messages all along some time in our millions of years of evolution and we just weren’t listening, or not capable of it? Maybe they gave up? JACOB HAQQ-MISRA: Absolutely, absolutely. That is totally a possibility. And we have only searched a drop in the bucket of the possible signals. One analogy I’ll bring up real quickly, Jill Tarter of the SETI Institute, she likes to point out that the existing SETI searches are taking a glass of water, being in a boat in the middle of the ocean, you dunk the glass into the ocean and you ask, are there any fish in the ocean? And you look at your glass and it’s empty water because there’s no fish in there. So does that mean there’s no fish in the ocean? Well no, it just means you’ve can searched a very small portion of the total sample space. And we’ve searched a very small portion of the sky in a very small portion of the frequencies. So it’s quite possible we haven’t been looking long enough. IRA FLATOW: She has a way with words. I’m thinking now that I’m a very advanced civilization. Why would I expect that these advanced civilizations are still communicating in the ancient field of radio waves? I mean, we’re not using tin cans and strings anymore. If they’re so advanced, maybe they’ve learned how to do gravity waves or some other kind of thing and they’re not even listening in radio waves. JACOB HAQQ-MISRA: No, I think that’s a really important point actually. And maybe Kelly and Sheri have something to say, but I think that’s exactly right. And it’s quite possible, maybe very likely, any extraterrestrials we meet to contact would be far more advanced than us. So if you think about sailboats as an analogy, sailboats at one time used to be the pinnacle of technology. All our militaries are outfitted with boats with sails. Today, we still have sailboats but they do not reflect the pinnacle of technology of our militaries. And so in the same way radio might still exist on another planet. You might have ham radio operators that do this for fun, even if they’re not using radio as a primary means of communication. So that might be a strong reason for us to actually transmit. We may have the onus as the younger, less advanced civilization, we have the onus of transmitting with radio waves, whereas they’re probably not going to. That’s one argument. IRA FLATOW: No, go ahead. KELLY SMITH: Yeah, I think for all you know, we may be bathed in tachyon transmissions right now, or some new technology that we don’t know how to interpret. And maybe it’s even sort of a test. It’s like, well, once you can answer, then you’ve definitely reached that level of technology. On the other hand I think when you’re doing any kind of METI work, you have to assume that there’s a partner on the other end of the message who’s making some efforts to interpret it. And so it seems a good bet that even a super advanced civilization would realize that radio communications is likely to be one of the first ways civilization starts, and then maybe laser communications. And so if they want to find a signal, they will probably be looking for these more primitive ways of communicating. IRA FLATOW: Are there people actively messaging the stars today? And who might they be, Kelly? KELLY SMITH: There are definitely people who are messaging the stars. I mean there have been a couple of dozen attempts that we know of in the past– since, let’s see, ’72 I think was the first major one. In fact I just got an announcement the other day about a new predicted attempt that’s going to be performed in May from an array in Sweden. So this stuff does go on. And of course we’ve been leaking electromagnetic radiation into space since Marconi. So in some sense the signals are out there. But the difference– I mean, at least some of the more problematic terms I would say– the difference is that they’re much, much more energetic. So it’s one thing to leak a very weak radio signal in space, and then the power of that signal drops off with the square of the distance. So if you wanted to watch I Love Lucy 50 light years away, you’d need an antenna the size of the solar system. It’s possible, but it requires some real effort. But with METI you’re talking about aiming a laser at a likely planet and pumping an enormous amount of energy into it. JACOB HAQQ-MISRA: Well, so actually I would take issue with that. They’re not doing laser METI for very much. It’s mostly radio METI. KELLY SMITH: Well, either way. JACOB HAQQ-MISRA: But that is important because laser is much more directed and spreads a little less than radio. And so it is relevant. But I think it’s also important to say that there have been these handful of messages that have gone out. Some of them maybe are louder than the background radiation. But in order to be detectable, you need to get your message off more than once. I would argue that essentially none of these past messages that have gone out are going to be detected. It would be like our Wow! signal where you see it once and you have no way of verifying it. So I still think the most detectable signal that we have coming out from Earth are television carrier waves, which go– and radio carrier waves– go in all directions at all times, and military and astronomical radar like pins on a pin cushion. They’re not going in all directions at all time but they are by far the most detectable signal emanating from Earth, orders of magnitude louder than any METI signal. IRA FLATOW: Sheri, if you think that the kinds of messages we’ve been sending out like on the Voyager golden record have too much information, how would you design a signal that’s unambiguously a signal made by a life rather than a radio wave or an X-ray, rays released by stars or something? What would your signal be? SHERI WELLS-JENSEN: We have a conference here if you’d like the answer to that question. I think there’s maybe 150 people in attendance. You probably could get about 400 answers to that question. IRA FLATOW: Give me your answer. SHERI WELLS-JENSEN: The goal is to be, I think for me, the goal is to be as simple and sensible as possible. We’ve got a whole lot of stuff. I mean for heaven’s sakes there was even a Doritos commercial that was broadcast with power to the stars. So I think one of the things that it would behoove us to do is get on the line and start making some sense so that– they’re receiving all this muddled stuff from Earth, and maybe just a nice clear– you could go back to a nice clear string of prime numbers. You could go back to just talking about the fact that you have an artificial signal. And maybe that’s all we’re ever going to get. Maybe just the binary, yes we exist is all we can hope for. IRA FLATOW: I just need to interrupt and pay the bills here. I’m Ira Flatow. This is Science Friday from WNYC Studios. OK, go ahead. JACOB HAQQ-MISRA: So Sheri, I really like that. I had a question for you based on a project I was involved in with Michael Busch, who’s at the SETI Institute, but this ties in with historical METI work, where Michael devised a code that was not just prime numbers, took one step further where he defined basic arithmetic. 0 equals 0, 1 equals 1, 1 plus 0 is 1, and so on. And you can use that to define arithmetic and the periodic table of elements. And I think we got as far as you could describe the structure of the solar system and even our transmitter. And so you couldn’t say hello. You couldn’t say, we come in peace. That’s too human. But there was actually quite a bit of math and science we could talk about. Do you think that’s reasonable? SHERI WELLS-JENSEN: Well you know, OK, so anything I think is reasonable is reasonable for a human being, which means I have no idea. I mean, you can take any group of sort of people who like puzzles and you can put together like the Freudenthal system where you teach them equals, plus-minus, not true, and you can tell them. You can make things. You can say this is a circle. You can make the word for circle. And it’s fun. It’s fun to play with. Whether that’s at all intelligible to people who aren’t humans, there are 150 people at this conference, right? I don’t know, there’s probably 400 opinions. IRA FLATOW: OK, let’s go to the phones. Let’s go out to New Haven, Connecticut. Hi Colin. Welcome to Science Friday. COLIN: Hi, thanks for your program. I had just a quick question is, suppose we do get an indication that someone’s heard our message. What would we do with that? How do we further the communication, the conversation? JACOB HAQQ-MISRA: Well, I’ll say one thing first, and then I’m sure Kelly and then Sheri have something to say. I think for me the neatest thing about that is the intergenerational aspect. If we send a message and we get a reply, that means we have successfully managed a project probably over 70 years or longer, because it takes however many light years away the star is for the signal to get there. If someone listens to it and they reply, it means that it’s taken that long to get back. So we’re not very good at long-term projects right now on Earth. I could cite many examples. I’m sure all of you listening could as well. So if we got that, I think, to me, that would be even more exciting, or equally as exciting as whatever the message says. Probably that’s exciting too. But the fact that we are really seriously talking about doing an intergenerational project would be historically significant. SHERI WELLS-JENSEN: Yes, it’s an activity in radical hope and radical faith in our descendants and in ourselves. Can we manage this thing? I mean, after we’re done jumping up and down and getting all excited. IRA FLATOW: But we are finding exoplanets that are close, like 40 light years away, things like that, that you could take one generation to get a signal back and forth. KELLY SMITH: That’s true. I still think though– and again, I don’t want to be a fearmonger here, but we don’t really know exactly what we’re dealing with. And there are a lot of very intelligent people like Stephen Hawking and David Brin who have talked about how responding to this kind of signal is not a good idea. The guidelines for SETI require international consultation before a message is sent back. And if you’d like an interesting scenario– I don’t want to give away anything, but The Three-Body Problem is a recent science fiction trilogy that talks about what can happen when you answer a message from an advanced civilization. And it’s not good. IRA FLATOW: Wow. I’ve seen the movie. JACOB HAQQ-MISRA: One thing I wonder about– one thing, Kelly, that I wonder what you think about this is, could listening be just as dangerous as receiving a message, or sending a message? Because if we’re worried about the Stephen Hawking, Jared Diamond cultural collapse phenomenon where we make contact with a more advanced society and it causes collapse on ours, simply the act of searching and receiving a message passively and interpreting that information could be very damaging to our civilization also. IRA FLATOW: All right, I’m going to ask you, Kelly, to hold on to that because we have to take a break and interrupt this very interesting discussion about extraterrestrials with Jacob Haqq-Misra, Sheri Wells-Jensen, Kelly Smith. Our number, 844-724-8255. Stay with us. We’ll be right back with lots more, and your questions, and your tweets. This is Science Friday. I’m Ira Flatow. 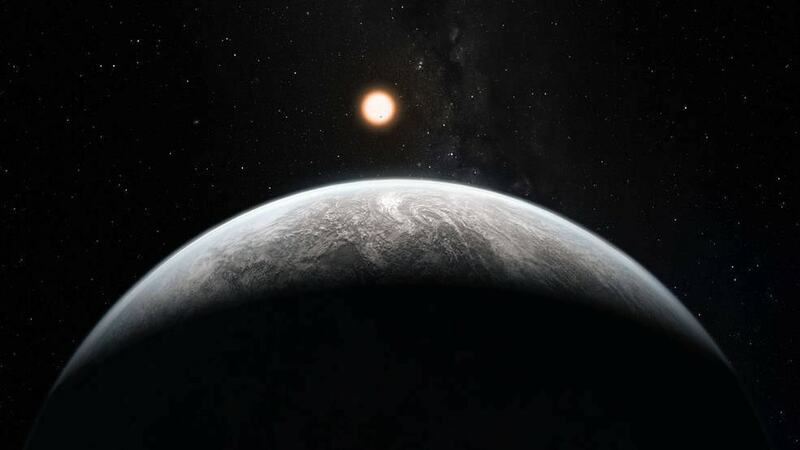 We’re talking this hour about how to communicate with intelligent life if it exists elsewhere in the universe, and whether or not that’s even a good idea, topics of discussion at the Social and Conceptual Issues in Astrobiology conference in Reno, Nevada this weekend. And my guests are Kelly Smith, associate professor of philosophy at Clemson, Sheri Wells-Jensen at Bowling Green State University in Ohio, Jacob Haqq-Misra at Blue marble Space Institute of Science. And our number, 844-724-8255. Lots of people very interested in this. Let me see if I can go to a tweet or two here. How do we know that extra life is on the same sized scale as us? Maybe we’re so small that other lifeforms don’t pay any attention to us, or they’re too small for us to pay attention to? JACOB HAQQ-MISRA: That’s a great question. It makes me think of Hitchhiker’s Guide to the Galaxy where we somehow perturb a distant civilization and they come and they invade us and it turns out that they’re smaller than fleas. And so it has no impact on us when they launch their galactic warfare. So yes, to the question, absolutely there’s maybe some physical constraints based on what we know about how atoms form together and stuff. But yeah, we don’t know. We don’t know at all. SHERI WELLS-JENSEN: Yeah, I think the answer to all those questions is, oh, could be. Wouldn’t that be cool? IRA FLATOW: Let’s go out to Allentown, Pennsylvania. Hi, welcome to Science Friday. DAVID: Yeah, this is David. DAVID: This is David in Allentown. IRA FLATOW: Go for it. DAVID: This might be slightly off topic, I’m not sure, but I’m not so much concerned about encountering superhuman civilizations or super smart that might come over here, be predatory, and take all of our things. I’m much more concerned about sending out probes to find this life and they contact microbes or microorganisms for which we have no defense and when we bring these things back, they overwhelm our ecosystem. IRA FLATOW: Yeah, go ahead. KELLY SMITH: There definitely are folks at NASA who worry about what they call planetary protection. So their slogan is all the planets, all the time. And they worry about both how we might contaminate alien life on Mars or Europa or something like that, but then they also worry about bringing samples back to analyze on Earth. And so that’s definitely a real concern. I would say this though that the more different alien life is from us, the less likely their microbes would be able to infect us. That requires probably a certain level of similarity between the biochemical systems. And so anything’s possible, but it’s a decent bet that we wouldn’t have to worry too much about a completely different kind of life. IRA FLATOW: Is it possible that we could detect life as we don’t know it? KELLY SMITH: You know, that’s a really interesting question. I went to a National Academy of Sciences meeting about a year and a half ago, and I was on the panel that was assigned to remote detection of life as we don’t know it– so trying to figure out using telescopes and things like that whether there’s life as we don’t know it on another planet. And we talked for about 10 minutes and quickly decided that there was really nothing that we could say about this because if it’s life as we don’t know it, we don’t know what to look for. Now if you assume that life is roughly similar to ours– it has biochemistry based and stuff like that– then there are things you can start to look for. But it’s unclear how defensible an assumption that really is, right, whether life like us is common or not. –that would be unambiguous. And we’ve had Carl Sagan on the show many years ago talking about things like this, and Frank Drake, people like that. And they would talk about hydrogen atoms and all kinds of stuff, something that’s universal, mathematics. Is that something, that simple, maybe send out a rectangle or whatever? SHERI WELLS-JENSEN: I’m sort of a radical reductionist, right? I always think, just don’t send it. That’s too much. Whatever you’re thinking of sending, walk it back a step. IRA FLATOW: Like what, for example? SHERI WELLS-JENSEN: So maybe we just want a blank carrier wave just so that it is clearly artificial. Or we could go back to the old string of prime numbers. But even that, when we’re thinking about– all we know about those other folks is that they received our signal, that they have constructed some kind of technology that allowed them to send or answer the signal. That’s all we know. We don’t know how they built that radio telescope. We don’t know what their culture and society– we don’t know what their sensory apparatus is like. We don’t know what their bodies are like. We don’t know if they still believe in magic, if that’s their underlying cultural conception of science, but it was working at least up until the point that they could build a thing. We don’t know. KELLY SMITH: Well, I’ll just add to that that this is actually one of the points that people in this area argue about is the extent to which we can extrapolate from humanity to aliens. And I think there’s a good argument– certainly what Sheri says is right. You don’t know all these details. But on the other hand if you ask something like, well, would an advanced civilization capable of building radio telescopes understand mathematics, it seems to me and a lot of other people that the answer to that has got to be yes. Their symbology may be different. They may think about it in different kinds of ways. But it’s hard to imagine a civilization that could build a radio telescope that would not recognize prime numbers as very special. IRA FLATOW: Yeah, I’m sorry, go ahead. JACOB HAQQ-MISRA: Oh yeah, I completely agree with that, that the ability to build a radio transmitter is really what we’re after here. And I think just for listeners in case you’re confused, the way that you do SETI searching and METI transmitting, this is not a way to find all possible lifeforms that might exist in the universe. It’s really a way to find life forms that have the ability to build a radio transmitter. That’s all we are able to say with this. IRA FLATOW: What about if we receive information? We’re just receiving a message from ET that could be damaging to our society. What if they share information we don’t want to hear? KELLY SMITH: Yes, as Jacob points out, there are some people who are very worried about that. I personally am not that concerned about that. I think one man’s cultural collapse is another man’s progress, right? But I do think that it’s kind of funny sometimes to listen to scientists who really want to make contact with aliens because I always point out, you know that’s going to put you out of a job if they’re nice, right? If they send us technology primer 1A, you’re just going to be a remedial educator for the rest of your career. JACOB HAQQ-MISRA: I think I would happily take that job to make contact with them. SHERI WELLS-JENSEN: I’m ready. Let’s go. And at some point you just have to decide, well, who are you? Are you a person that– what kind of– what is it that you do as a species? Are you a reacher outer? Are you a hider? What do you do? IRA FLATOW: Let’s say we find evidence that life might exist under the ice, let’s say in Enceladus, one of the moons out there. And maybe it’s not intelligent, but do we have an ethical obligation to that life not to contaminate it, not to disturb it? What is the ethics of this? Do you think about that? SHERI WELLS-JENSEN: Go Kelly, go. KELLY SMITH: Yeah, I’m going to go ahead and say it. My personal view is that while it’s certainly defensible to say that microbes have some kind of moral rights, I think what oftentimes people forget is that so do humans. Humans clearly have moral status. And in fact I think most philosophers would agree that humans have superior moral status. And so it’s one thing to ask, should we do something to a microbe in isolation? The answer is probably no. But that’s not the way real decisions work. Real decisions are– there’s something valuable that we want as humans. And in order to get that we have to take some risk of harming microbes. In the case of microbes living, or even more complicated animals living underneath an ice sheet, you’re not going to be able to penetrate that ice sheet and explore that ecosystem without taking a risk of contaminating it, because it’s very difficult to completely sterilize a probe. And then you’re going to have to decide, well, do we want to explore the most important scientific discovery ever made or do we want to leave it alone and just let it do its thing? IRA FLATOW: My last question to all of you, do you wake up every morning and say, hey, today’s the day we’re going to find something. KELLY SMITH: Well, I do have SETI@home on my laptop. And I’m hoping that that’s my ticket to Stockholm one day. SHERI WELLS-JENSEN: And I am doing the radical back and forth. I am so hopeful, it’s going to be today. It’s never going to happen. It’s going to be today. It’s never going to happen. I like that whiplash, that emotional whiplash. That’s a power source for me. IRA FLATOW: –it all very seriously. Even though you joke about it, you take it seriously. JACOB HAQQ-MISRA: And my excitement– I don’t expect that we find SETI succeeding every morning I wake up, but I do get excited about the new planets we find literally every week now. And that’s really exciting. And that is narrowing the scope on where we’re going to look for intelligent life. IRA FLATOW: All right, I want to thank all of you for taking time to be with us today, very interesting. Jacob Haqq-Misra, a research scientist at Blue Marble Space Institute of Science. That’s based in Clayton, Delaware. Sheri Wells-Jensen, linguist and associate professor of English at Bowling Green State University in Ohio. Kelly Smith, acting president of the Social and Conceptual Issues in Astrobiology group. He’s also Associate professor at Clemson University in South Carolina. Thank you all for joining me today. KELLY SMITH: Thank you Ira. SHERI WELLS-JENSEN: Thank you. It was fun. JACOB HAQQ-MISRA: Thanks a lot.